Modular camper van interiors are all the rage right now. Why? It’s simple: because they allow the user ultimate flexibility in the layout of their van. No longer are we confined to single layouts or deconstructing an entire unit should we want it changed; modular furniture could just be the future of van conversions, striking a balance between living space and cargo hauling, and Austrian company Autocom have executed this beautifully in their newest creation, the CargoCamper, unveiled at the CMT show in Stuttgart, Germany this month. Invented by Autocom Rental & Trading GmbH, CargoClips was originally a system designed to provide flexible and adaptable cargo-hauling solutions to be installed in vans. 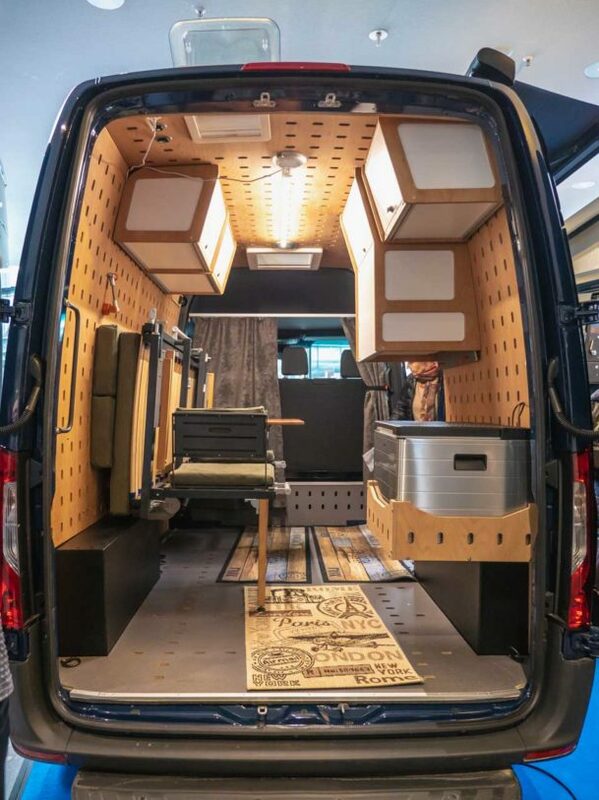 Now they’ve upped their game, and have created two highly versatile camper vans using this system, one in a Mercedes Sprinter, and one in a MAN TGE, not a van we often see used for conversions. One of the CargoClips base vans is a MAN TGE, MAN’s first entry into the LGV market. The core of this design is what is essentially a jumbo-sized pegboard, occupying the walls, floor and ceiling of a van, much like what you’d find in your dad’s workshop but with larger oval-shaped holes. 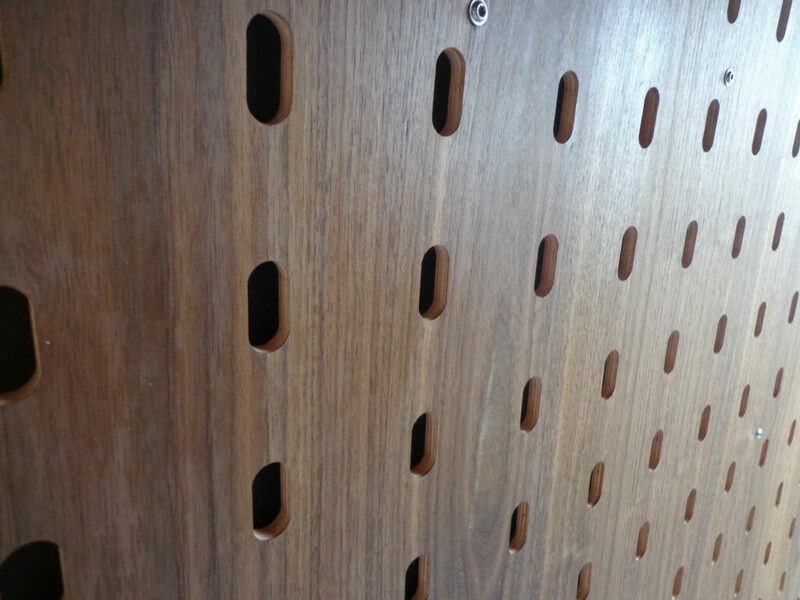 These are created using perforated plywood wall panelling, and the system works by using a matching oval-shaped nut which twists 90º once inserted through the hole to secure the screw against the panel. This system is particularly clever as it does not require any tools to use; the bolts are simply twisted in by hand, making installation a breeze. Each hole can hold up to 150kg (330lbs), and are attached to the van’s walls and ceiling using special screws. A close up of the pegboard system created by Autocom. 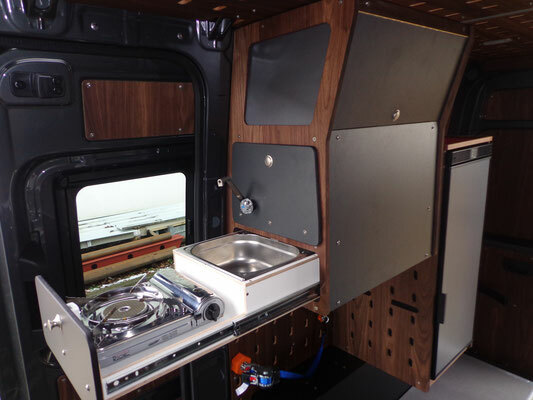 This versatile modular system means that the interior of Autocom’s camper vans has as many different layout combinations as there are rolls of a dice. The CargoClips system can be used not just for furniture, but to add seats, store tools or carry gear. The interior, while a little bizarre and totally different in appearance to anything else on the market, features walnut wall and ceiling panelling for a homely effect. From here, a variety of different furniture modules can be installed, such as the B&B module- a convertible dining/sleeping area which folds flat against the driver-side wall once mounted, and can then be unfolded into multiple different configurations: a dining table and seats, a sofa, a single or a double bed, much like a piece of origami paper. The B&B module folds flat against the wall when not in use…. …And folds into a sofa, double or single bed in the evening. When it comes to the kitchen, Autocom have thrown the rule book out of the window, as the kitchen module is in fact attached to the wall, leaving plenty of floor space underneath. In this unique design a single burner gas stove is stowed away in a drawer, which is pulled out to be used. The “sink” is actually a swivel-out tap attached to the face of a drawer which contains a water tank inside, with a small stainless steel basin concealed in the drawer below. 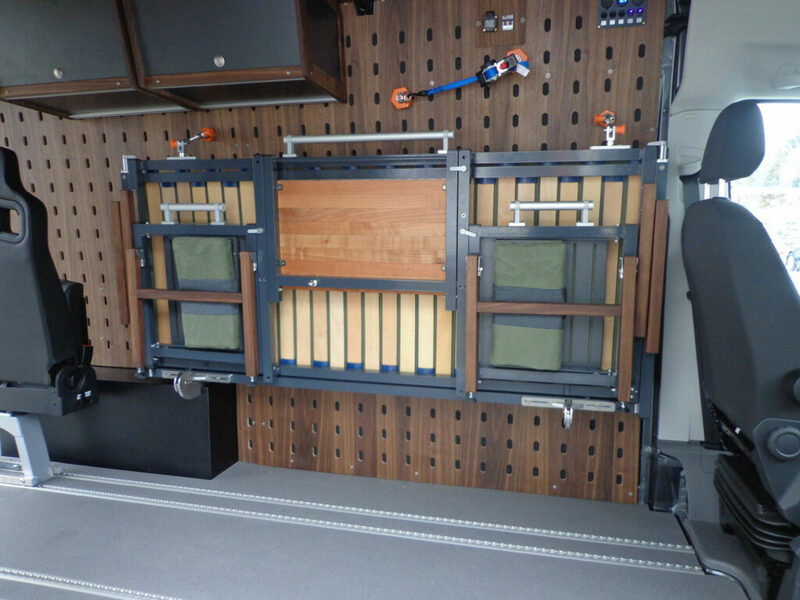 The 90L fridge is mounted separately towards the rear of the van, but this kitchen can be chop and changed however the user sees fit for their needs. The floating kitchen module, with sink and gas stove visible. 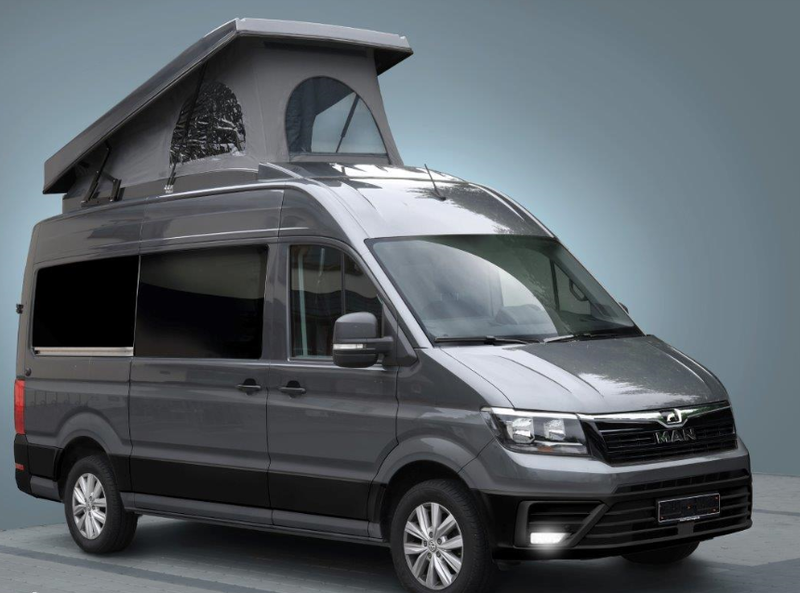 Different bathroom modules will be available soon for purchase individually, and are expected to incorporate an “open bathroom” with a sink, shower and toilet just inside the rear of the van. Both of the CargoClips campers come with a bathroom unit pre-installed. 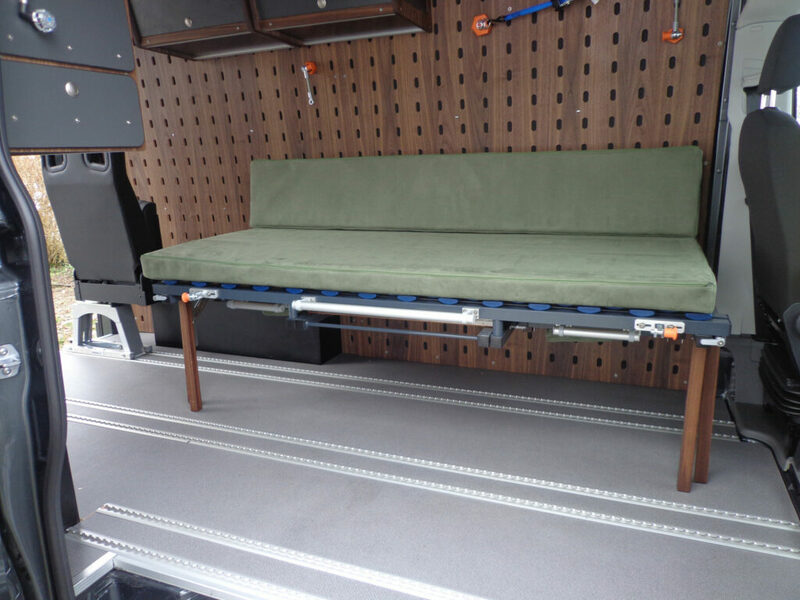 Each of the camper van modules are available to purchase individually for varying prices, and there’s a huge catalogue of them to choose from, everything from a vanity unit to a pull-out single bed to a foldable shelf which acts as a double bed. Everything in this van is a multifunctional, ultra practical piece of kit. The modular vanity unit installed in the rear of the van. The two different base vans on offer come with two similar layouts but with key differences. The MAN Mountain (a MAN TGE 3.180) is the meatier of the two with 4WD and off-road capabilities. It has a pop-top roof where the double bed lives, and comes with the B&B and kitchen units installed, along with upper cabinets and fold-away rear seats which are installed on floor rails. This van’s 2.0L engine can deliver 174bhp with a 6 speed manual transmission, LED headlights, an infotainment system and a Satnav just to name a few of its features. The MAN TGE van, fitted out with a pop top roof to create space for a family of four. 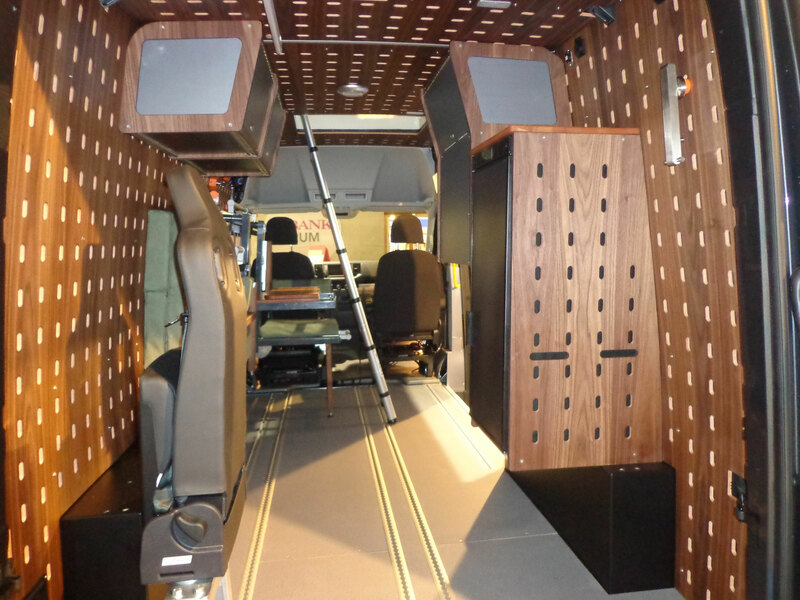 The 3rd gen Mercedes Sprinter will come with many of the same interior features, however it is shorter, decorated with lighter wall panels, incorporates a smaller 40L fridge, and is lacking in rear seats, although it does make up for this with added storage and extra pegboard holes in the floor, which is off-set from the rest of the van’s panelling with a different shade of wood. 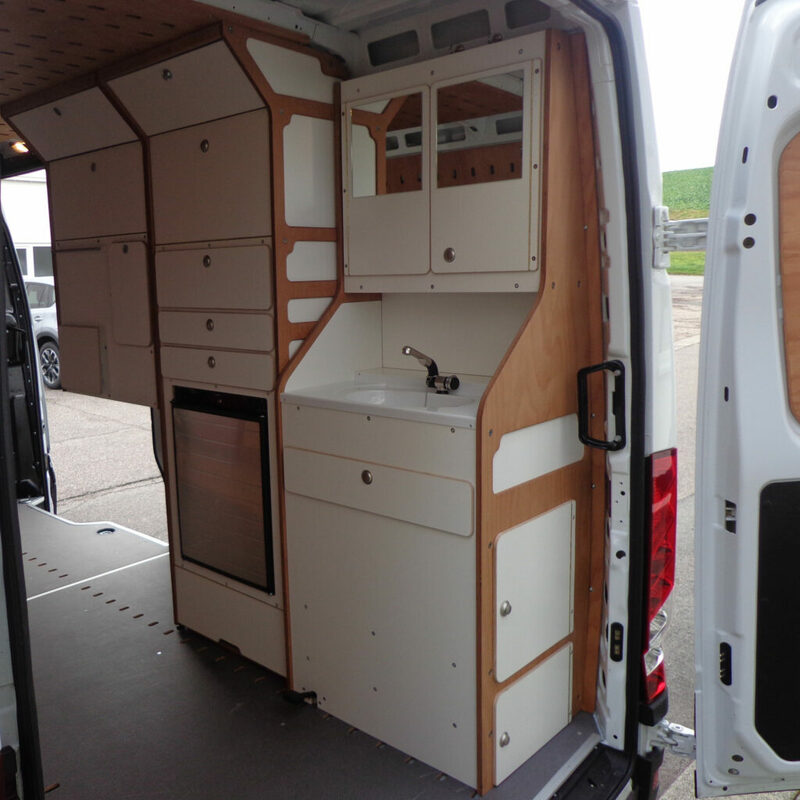 The smaller Mercedes Sprinter, with kitchen, bed and fridge modules. Both camper vans come with a leisure battery, LED lighting, a bathroom module and wall cabinets. Autocom Rental & Trading GmBH are currently offering three different camper van packages for three different prices. 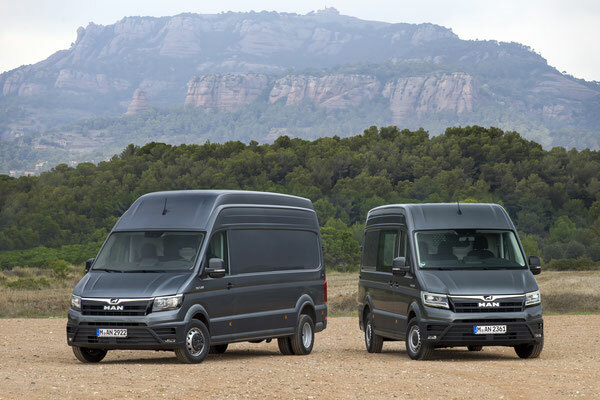 There’s “the works”, the MAN Mountain TGE van with 4WD and all modules installed for a hefty €79,000 ($91,000), or the cheaper alternative, a simplified layout in a MAN TGE FWD van with a lower 136bhp engine, for €59,900 ($68,275). The Sprinter City package is the smallest and cheapest of the three at just €49,900 ($56,850), and is the favourite for those searching for a work van and camper all in one. The company also displays various layouts on their website which incorporate workshop tool storage cabinets and workbenches, bike holding mounts, and locking bars and belt clips for securing cargo. For a mobile mechanic, a family and friends on a camping trip, or someone looking to double up their work van as a camper, the CargoClips system is an ingenious solution, and surely one to watch for in the future.